Stormandstars.net: Whats Tha? Narl Art? Matte vs. Shiny! I'm trying to fit in some posts while I catch up on orders in my shop, but I am a little all over the place so SORRY!! After this month I should be back on a normal schedule and I plan on posting 3 days a week, they may vary some weeks, but should be pretty consistent. I also have some exciting things coming for you! I'm working with some other IGers to start weekly nail art challenge and I'll definitely have more art in general coming your way! I updated my new header and I even have an official logo now. You can see it up in the header, its the twister on the left side. I also have a new nail shape to reveal. If you follow me in Instagram I already showed a sneak peek of it a couple nights ago. Today's art was inspired by a polish. When I put on Bliss Polish's Jax I knew I needed to do some sort of Matte vs. 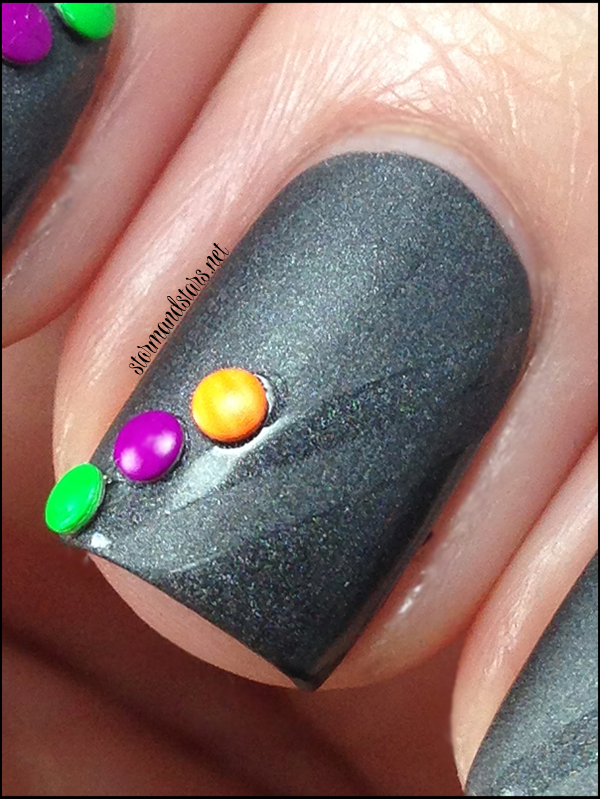 Shiny nail art with it and I actually did this manicure back when I reviewed Jax, but I never posted it. So you'll see square nails here, but they are from a while back. Shall we see the art? 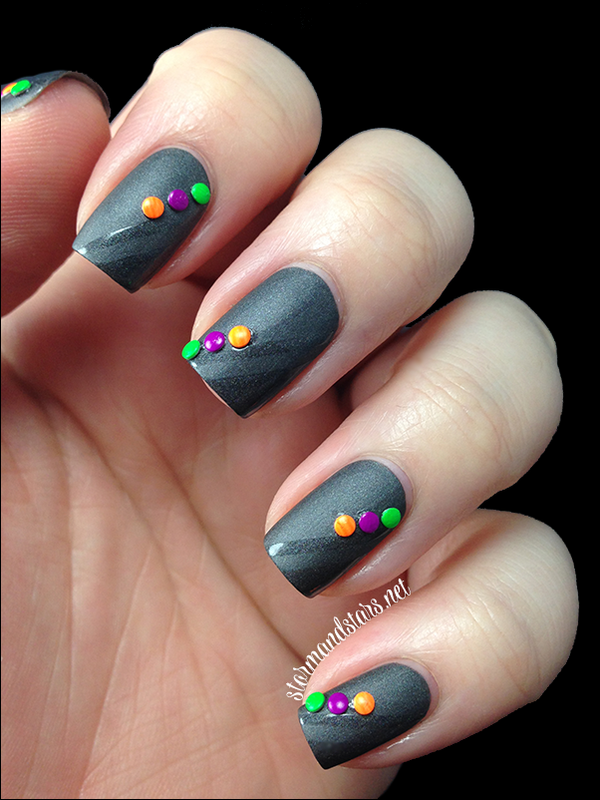 I started this manicure with two super perfect coats of Bliss Polish Jax. This polish is seriously like butter. It practically paints itself. I am completely in love. After letting Jax dry for a couple hours just to make sure it was 100% dry, I used striping tape to tape off some sections of my nails. I chose an angle with a small stripe as my design. I then painted over the tape with a clear topcoat and peeled off the tape. 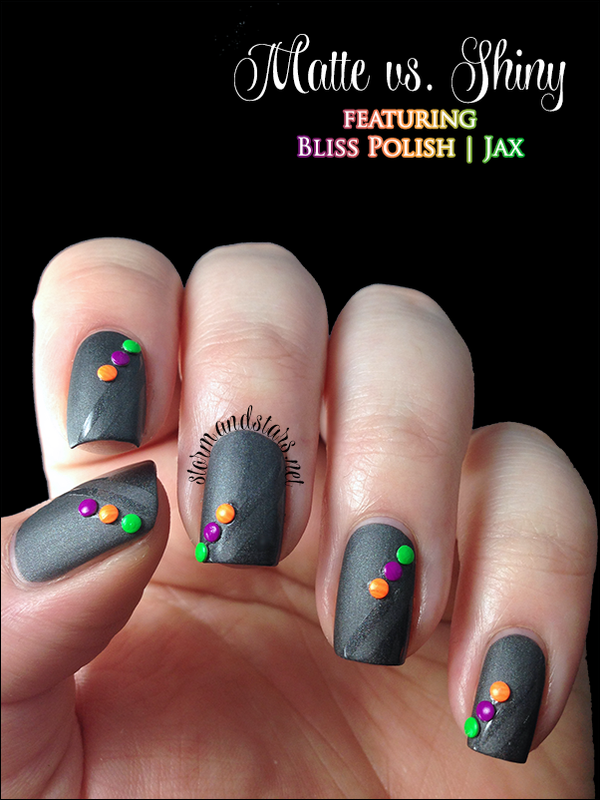 You can see where I put the topcoat it made Jax shiny and created a very subtle design on the nail. 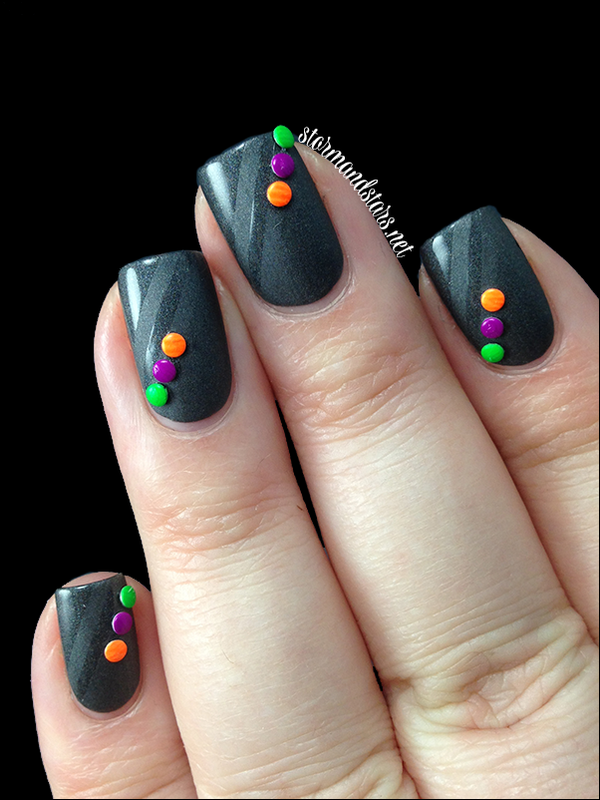 It was around Halloween when I did this mani and I knew I had some studs around somewhere so I picked out some Halloween-like colors and went to work adding them to the design. 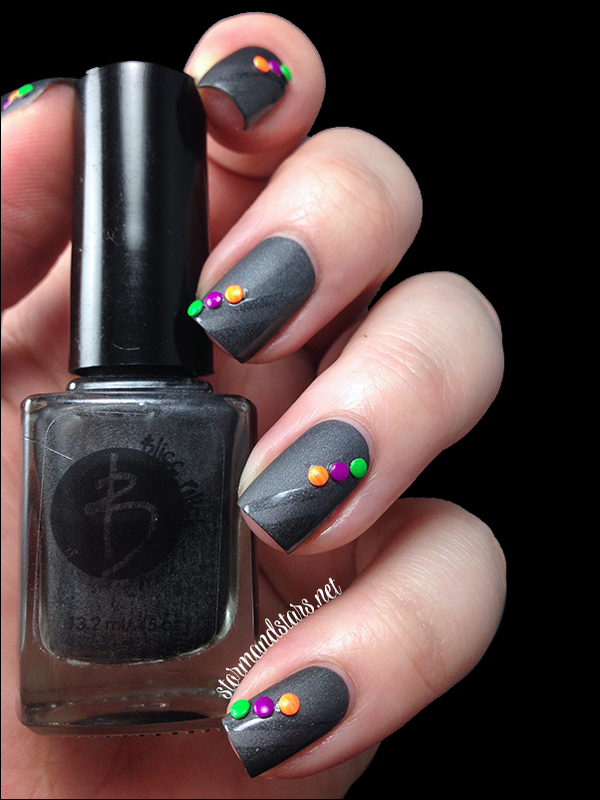 I used a toothpick dipper in topcoat to dab a bit on my nail and then stuck the studs down on top of it. Overall I was pretty happy with this design. Looking back I think I would use silver studs or even leave them off altogether, but I don't think they look bad either! Have you ever done a Matte vs. Shiny manicure? I'd love to see what you all come up with! If you are inspired by one of my manicures you can tag me on Instagram or Twitter using #hellostormandstars so I can see it!